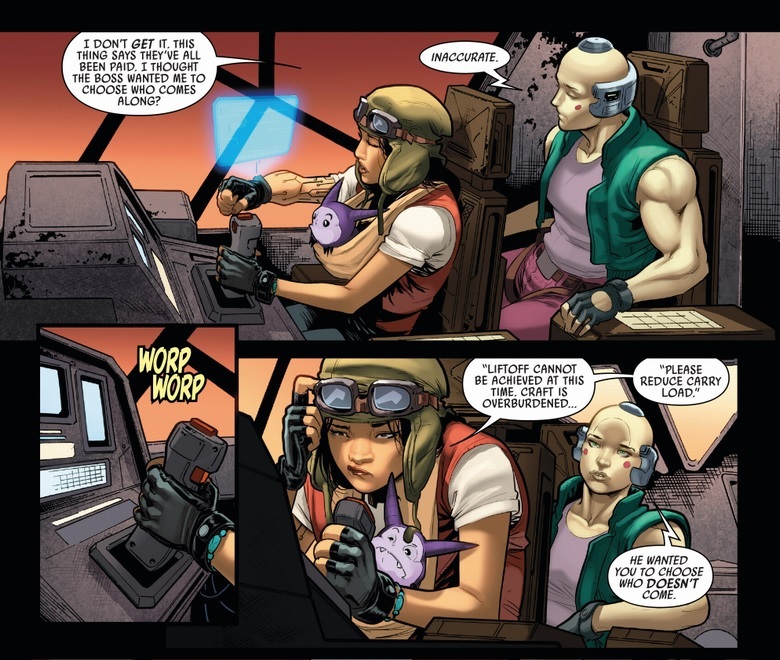 scans_daily | Doctor Aphra #15 - "Remastered, Part II"
Yes, but the problem is, Aphra's never exactly been what I'd call likable. Likeable, probably not. Entertaining, absolutely. Unlike those droids with her, whom the joke has long since worn thin on. Are we pre or post Alderaan in the timeline here? Because if it is pre, then I know where would be a good place to send them. 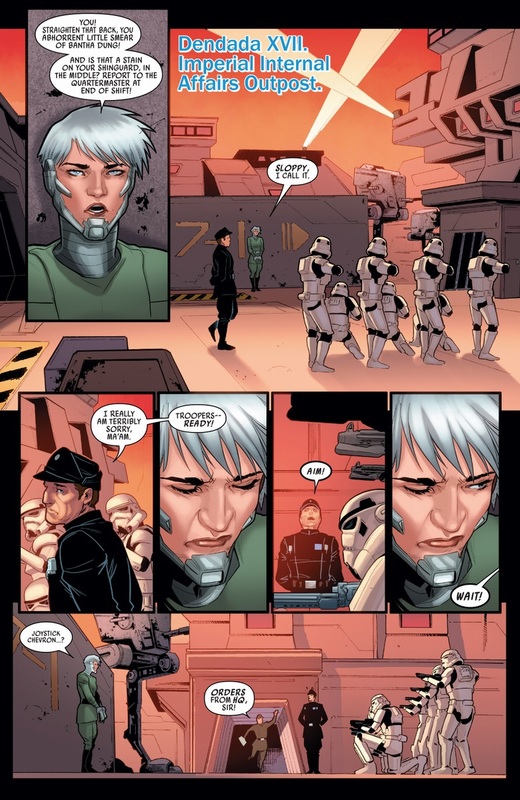 She was introduced when Vader was hunting Luke and company, so yeah, post-Alderaan. 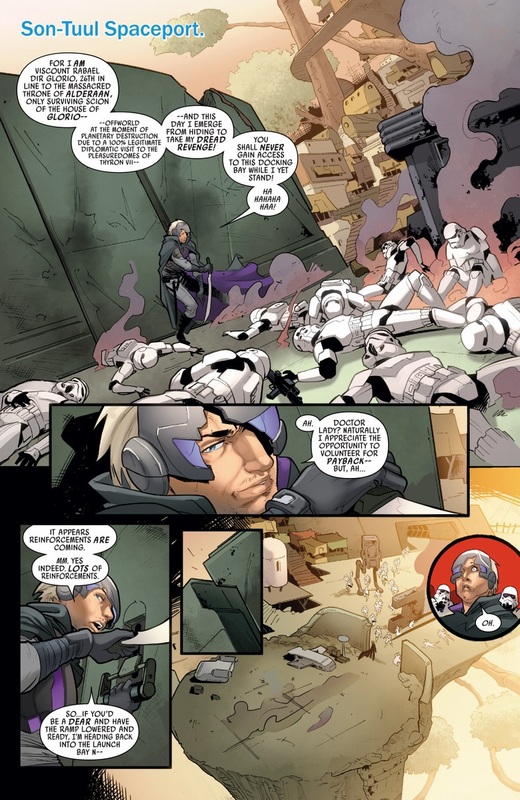 Part of the "joke" with that guy in the scans above is that he's a survivor of Alderaan looking for revenge. I managed to miss that, didn't I? I have no idea how. Sorry. Just ignore me, I'll see myself out. It took me a few minutes also. 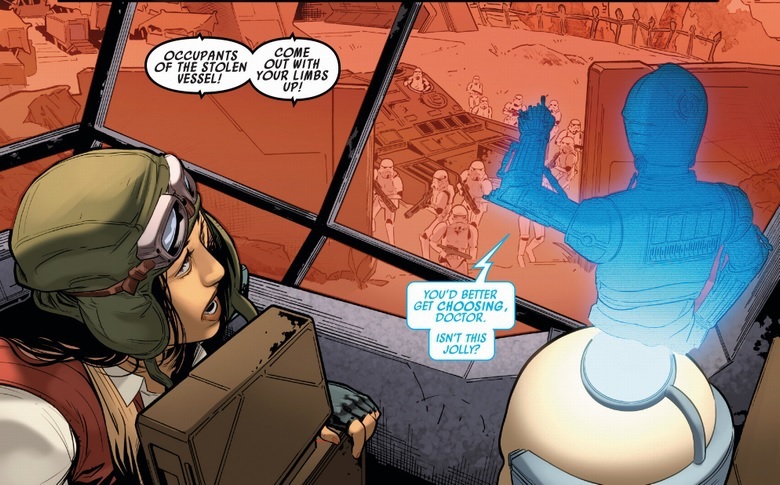 The scan where she's talking about all the various mercs, she quips that the Violet Ghost is "probably an undercover prince, something like that" and so very shortly after, we learn that he's just that. The humor's a little over-done, if you ask me... it's a little too much on the comedy side for what this story should be. But eh. It's amusing. 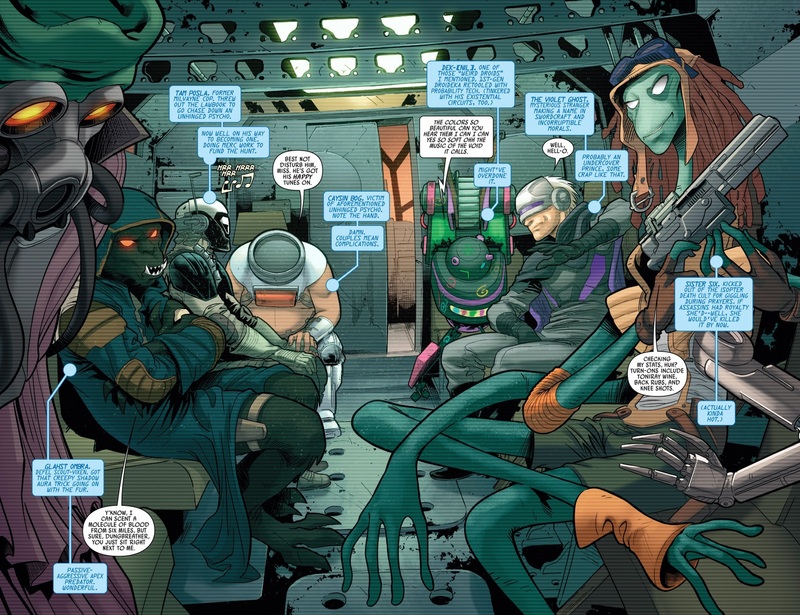 I was thinking why I find myself less and less engaged with Aphra and I think it is because her character never truly progresses. She is a completely amoral person who constantly is shown to have moments of character development that never go anywhere and it is having diminishing returns. 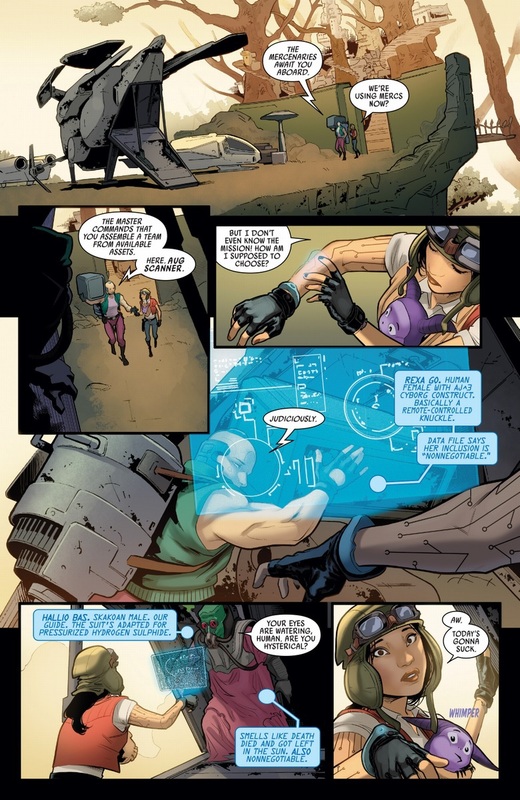 Again, most likely here Aphra will probably once again be able to masterfully escape her troubles, seem to have some kind of a moral awakening, except then it is revealed it was a scam and she is still the scumbag she always was. It is a decent story told once, but at a certain point it becomes difficult to get invested in her character arc. I think that goes into what kind of book is this? It this a book where a character evolves from point A to point B, changed for the experience? 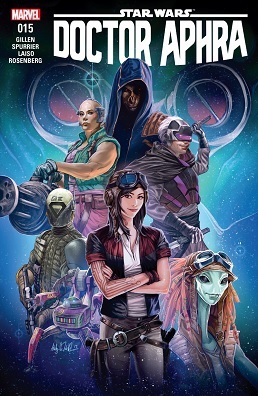 Or is this a book that is trying to establish a character that will survive the ravages of time and, nominally, join the universe as a recurring character? I think that this is more the latter than the former. It's acting more like a comic book with a resistance to changing the status quo *too* much, instead of like a movie where there's a clear beginning and end to a character's arc. Not that you're wrong for not investing in it, I just don't think this book is going to give you the development you're looking for. And I completely accept, this wasn't an argument that it makes the book bad. However, one of the things that makes it frustrating to me is that the book keeps hitting that same note of denied change. It's one thing to just constantly reinforce the status quo, but it is another to constantly tease against in the exactly the same way. The book can either be about the stagnant character or an evolving character. Where I think it goes weird is that it is trying to present a stagnant character as an evolving character. 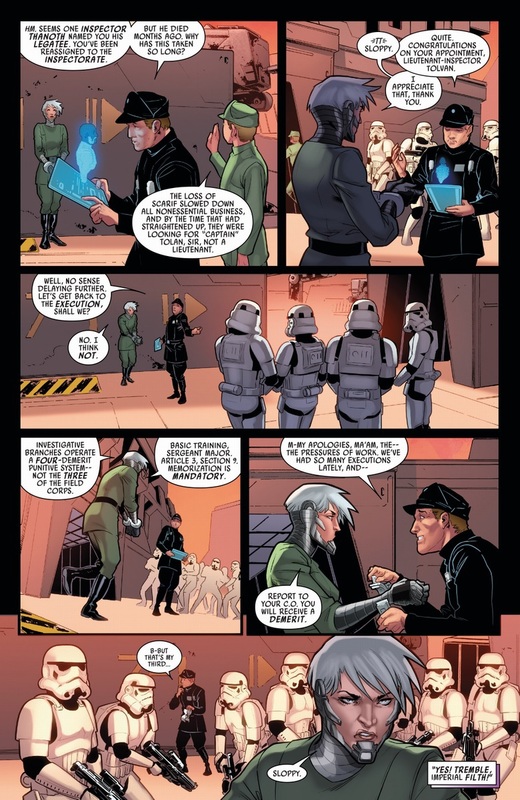 I do like how Aphra is attracted to an imperial officer. We don't get many good guy/bad guy attractions. And in this case, both sides are women! That's something we'd never expect from ANYTHING Star Wars unless BioWare was attached. Here's hoping this expands beyond book form.